NASA's Solar Dynamics Observatory captured this view of a rare encircling filament, the circular structure at center, on the sun on Oct. 30, 2017. Typical solar filaments on the sun are elongated strands, making the circular feature a rare sight, NASA officials said. A NASA spacecraft watching the sun has captured a rare view of a true space oddity: something scientists call an "encircling filament" near a "hole" in Earth's parent star. The filament, which was photographed by NASA's Solar Dynamics Observatory (SDO) between Oct. 29 and Oct. 31, appears as a tendril of dark material surrounding an active region on the sun's surface. The encircling filament can be seen in the center of the SDO image, which NASA released yesterday (Nov. 8). The image shows the sun as it appeared to SDO on Oct. 30 in the extreme ultraviolet wavelength of light. Solar filaments are vast clouds of charged particles that hover over the sun's surface and are tethered in place by invisible magnetic fields. 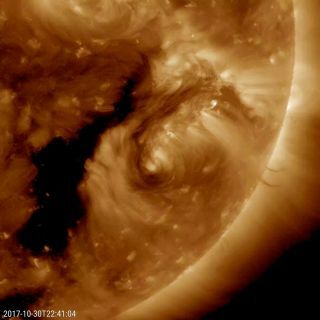 Normally, these filaments appear as elongated, ropy strands across the star's surface, so the circular formation spotted by SDO caught scientists' attention. "While it may have no scientific value, it is noteworthy because of its rarity," NASA officials wrote in the same statement. NASA's $850 million Solar Dynamics Observatory launched in 2010. It stares unblinkingly at the sun to record solar weather across many wavelengths and thus help scientists study and track solar weather events.